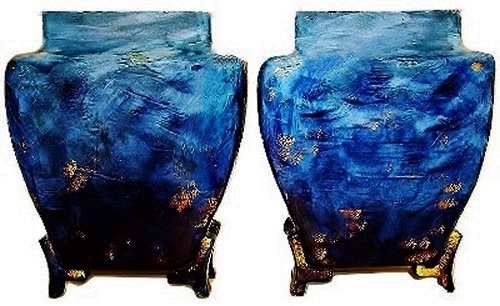 The art pottery movement began in the 1870s in America and Britain, coinciding roughly with the beginning of the Arts and Crafts movement, which gained momentum in the 1880s. Art pottery was more elaborate than utilitarian pottery and more aesthetically focused. 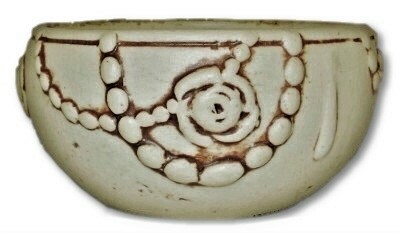 Early art pottery pieces were usually hand decorated, signed by the artist, and produced in limited numbers. 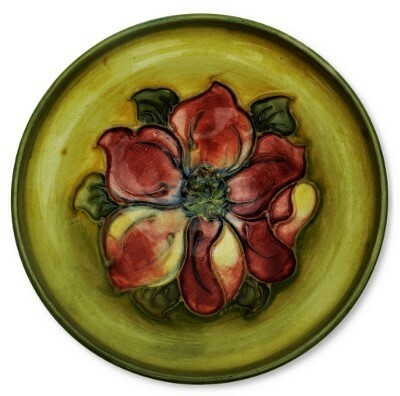 Many companies known for their art pottery, like Rookwood, Roseville, Frankoma, and Weller etc., were founded in the 1880s and 1890s. What ultimately set these companies apart were their ornamental designs. 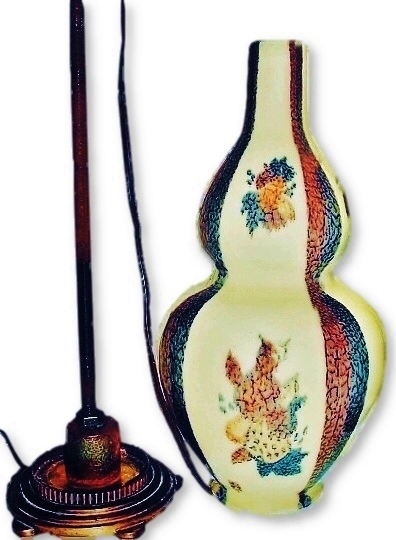 Rookwood and other companies took inspiration from Asian, Art Nouveau, Art Deco and Arts & Crafts styles, creating pieces that were both functional and beautiful. 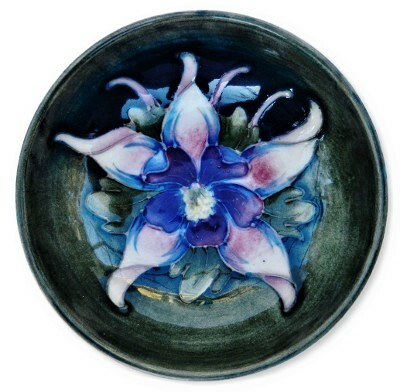 They worked in a variety of popular forms, from vases to bowls to wall sconces and decorative tiles. 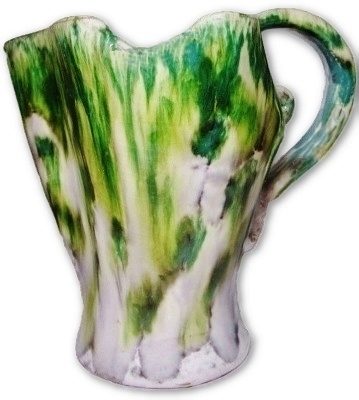 Decorative free form art pottery pitcher. 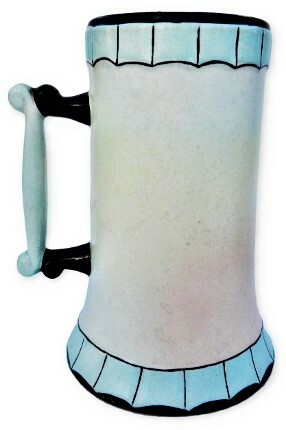 This is not a student item and possibly by one of the South Carolina or even Belgian artisans. Measures 6 1/4" X 6" X 5". No chips, cracks or repairs. 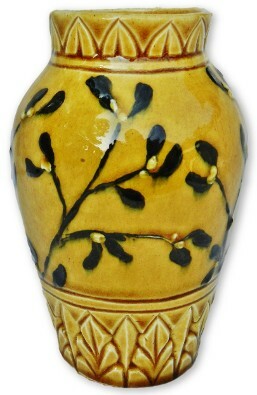 Cincinnati Pottery Club hand carved and painted underglaze vase by Alice Belle Holabird. 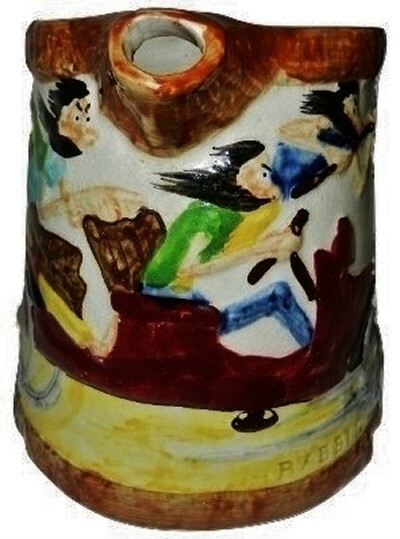 Ms. Holabird created this vase circa 1879 and she is known to have been the Treasurer among the original 12 members of the Cincinnati Pottery Club founded the same year. 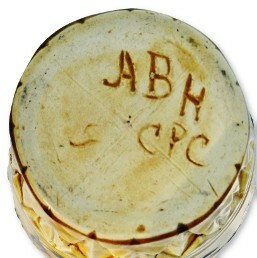 Hand incised ABH CPC and Y for a yellow body and glaze designation. Measures 5 1/2" X 3 1/2". No chips, cracks or repairs. 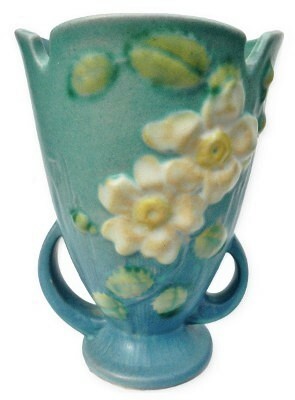 POTTERY CLUB OF CINCINNATI Hungarian Faience art pottery vase. 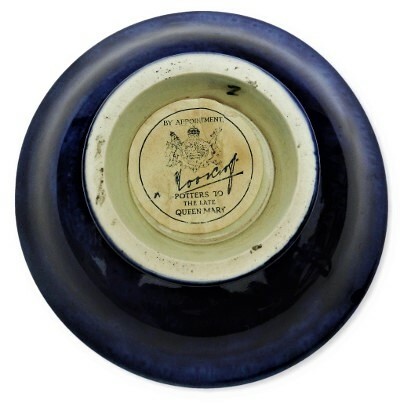 This item was made circa 1880 and is hand incised under glaze with the artist signature which appears to us to be M. Spencer. 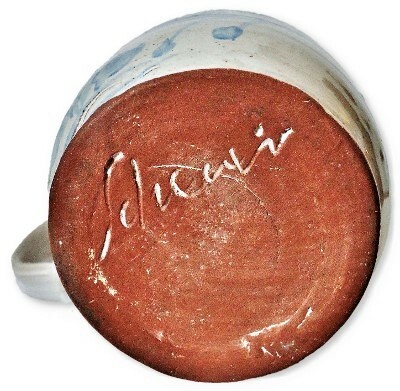 Part of the last name is illegible due to glaze fill in of the inscription. The style is very similar to items produced later in the 1800's by William Dell Pottery Company but what makes this item different is the lack of impressed W. Dell mark nor any shape # which is common for his work. 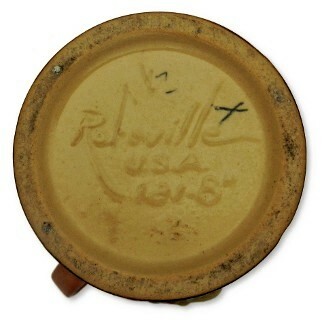 Mr. Dell was a member of the Pottery Club of Cincinnati for a short time and it was believed that he took much of the techniques learned while at the PCC to implement at his firm as his own designs. 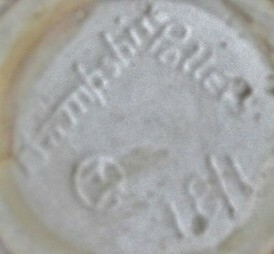 One of the founding members of the Pottery Club of Cincinnati was listed as Miss Mary Spencer, this item may be by this individual. 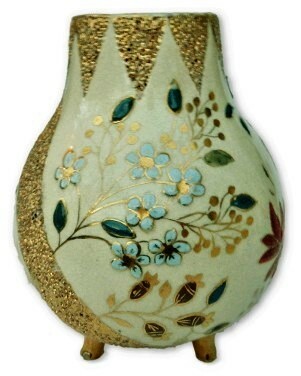 There are a few small condition issues such as a 1/8" flat chip/flake to the edge of one of the gold feet as well as some loss of the under glaze slip decoration contained in about 5 areas of the leaves and flowers. This item measures 7" X 5". There are no other chips, cracks or repairs. 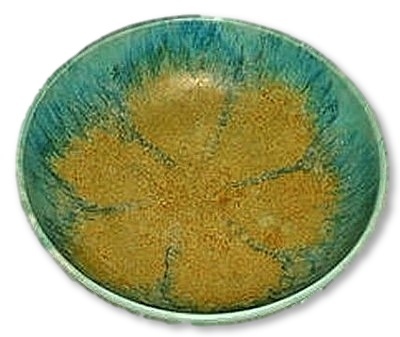 Clewell copper and bronze clad art pottery dish. Nice dark two tone early patina finish. 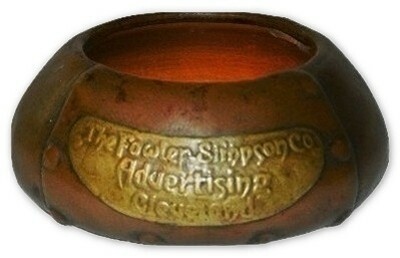 Decorated with a riveted pattern and a bronze plaque reading; "The Fowler-Simpson Co. Advertising Cleveland O. 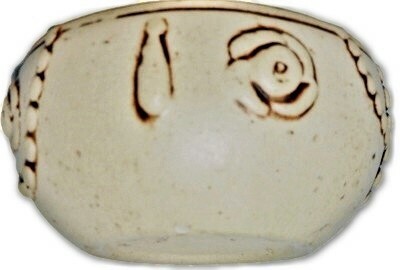 Marked on the underside with the circular Clewell Canton O. mark. 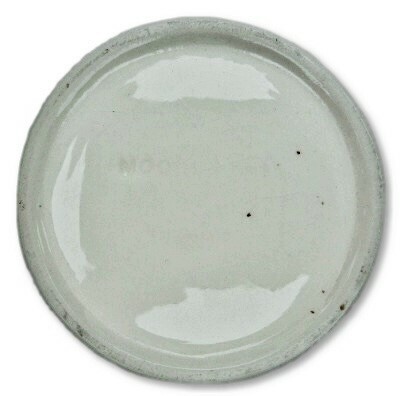 There is a small chip to the ceramic body under the rim as can be seen in our image at the 2:00 position. This does not extend to the copper clad or show easily from the exterior. Measures 4" across. No other chips, cracks or repairs. 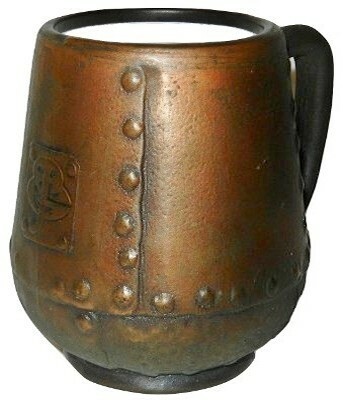 Clewell copper clad over white art pottery body mug. Rivet design embellished with a wonderful arts and crafts monogram. Marked on the underside in impressed letters; Clewell Canton Ohio. The original dark brown patina is very much intact. Measures 4 3/4" X 4 1/2" X 3 3/4". No chips, cracks repairs or damage. 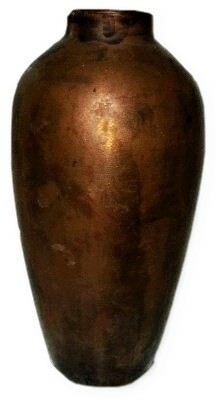 Clewell copper clad art pottery vase hand incised on the base "Clewell 330-5". 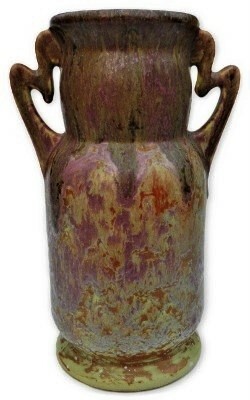 Covered in a dark brown with hints of verdigris early arts and crafts patina. Measures 4 5/8" tall, 3 1/2" across the top and 2 1/2" across the base. No chips, cracks or repairs. 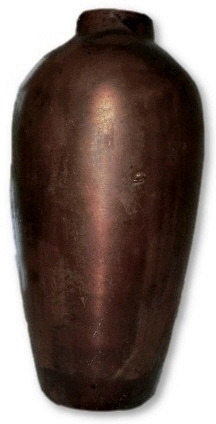 Clewell copper clad art pottery vase hand incised on the base "Clewell 368-7(?)" 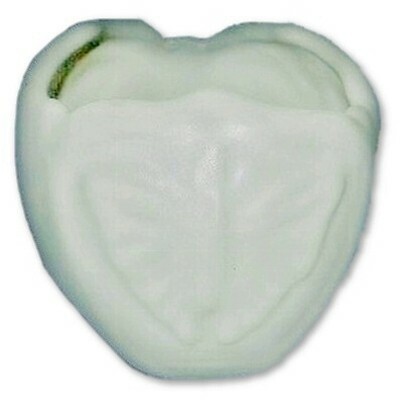 We are not positive of the shape number as it is lightly hand incised and very difficult for us to read. 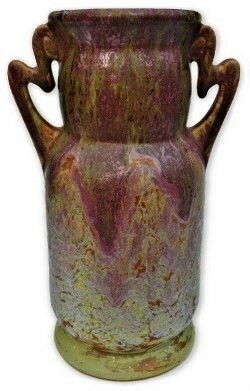 Covered in an older brown patina which appears to have been cleaned at some time in the vases past and has naturally returned with some streaking etc. Measures 7" tall, 3 1/4" across at the widest point. 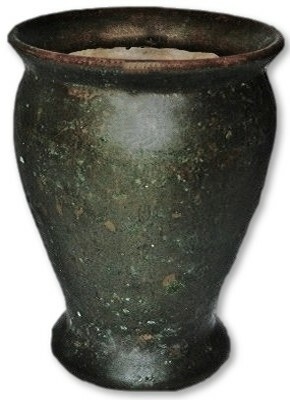 There is what appears to be a small spot mid body where something may have bumped the copper overlay at some time, causing it to make a ding in the metal, this can be seen in the second image though it does not go into the pottery body of the vase. No other chips, cracks or repairs. 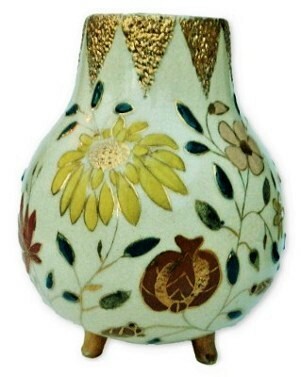 Arts & crafts early 20th century under glaze slip decorated Dickens character portrait vase. 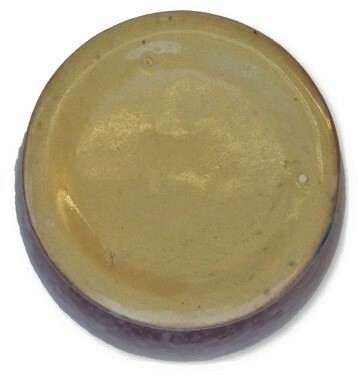 This wonderful item is very much in the form of WELLER 1st Dickens ware. 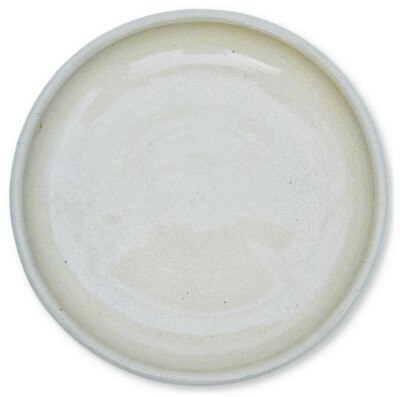 The item is impressed 6116 and VI hand painted under the glaze. 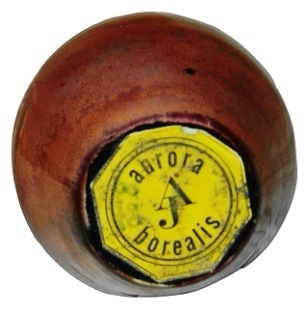 The detail is excellent and the decoration appears to be in the sgrafitto technique, hand incised and then hand slip painted within those incised lines. 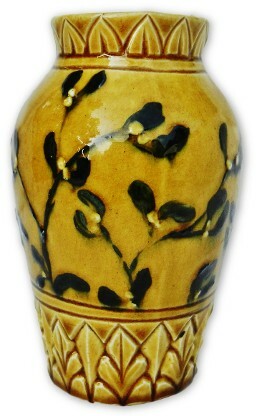 This vase has a white and umber checkered frieze running around the upper section. Measures 6 1/2" tall and 3 1/4" across at the widest point. No chips, cracks or repairs. 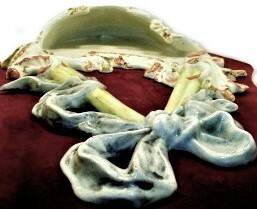 Continental Tin Glaze Faience wall pocket mounted on its original velvet board. Measures @ 14" X 10", the mounting board measures @ 20 1/2" X 13". There are no chips, cracks or repair. Hand painted under glaze exotic sea creatures, sea weed and corals. 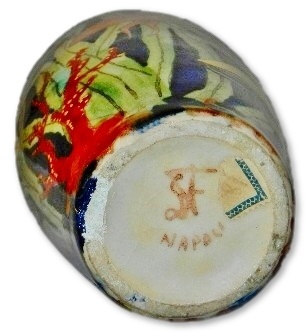 Marked on the base "Napoli". Measures 10 1/4" tall and 3 3/4" across at the widest point. 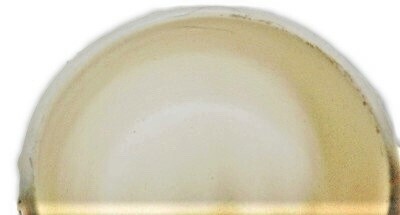 There is a crudely touched up chip on the bottom rim and a small touched up chip inside the top rim. No other chips, cracks or repairs. 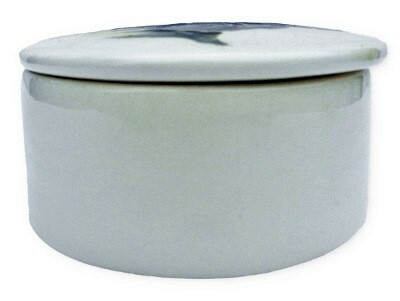 FULPER ink rectangle marked bowl. 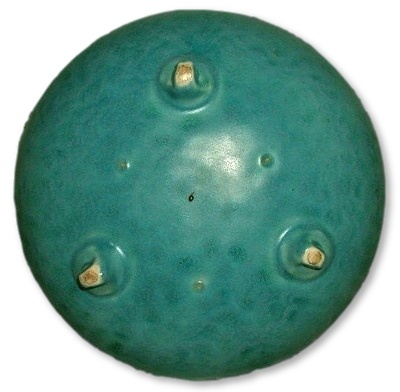 Measures 8" across and sitting 2 1/4" high. There is light overall crazing with 3 short lines at the rim which we are unable to feel. 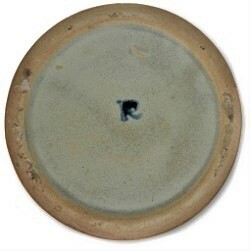 One of the 3 peg leg's appears to have pulled some of the ceramic away from the firing process or having been chipped shortly after the manufacture. No other chips, cracks or repairs. 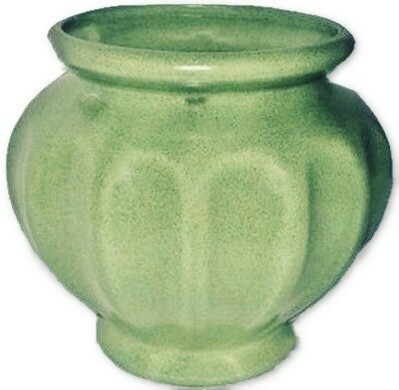 HAEGER USA @ mid century modern matte green jardiniere. Measures 8 1/2" wide and stands 7" tall. Marked on the underside HAEGER and faintly USA @. No chips, cracks or repairs. 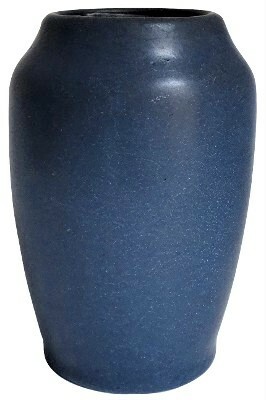 Hampshire Pottery 18/1 dark blue matte glazed vase. 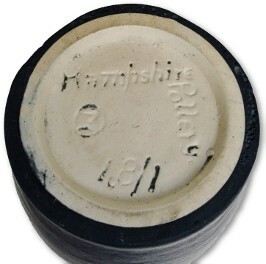 Impressed with the M in a circle, HAMPSHIRE POTTERY 18/1. Measures 5 1/2" tall and 3 1/2" across at the widest point. A few in the making tiny base edge grinding flakes of no harm. No chips, cracks or repairs. 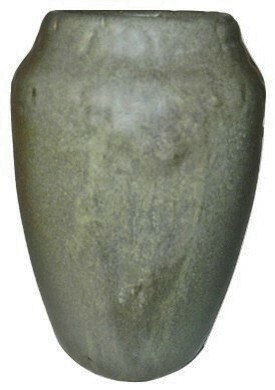 Hampshire Pottery 18/1 grey matte glazed vase. 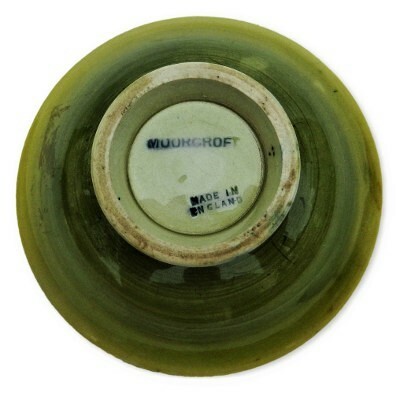 Impressed with the M in a circle, HAMPSHIRE POTTERY 18/1. Measures 5 1/2" tall and 3 1/2" across at the widest point. No chips, cracks or repairs. 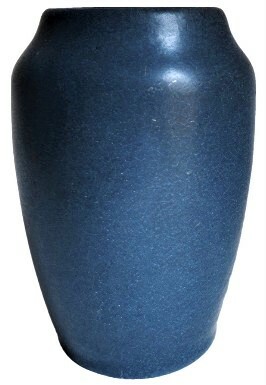 HULL ART USA H-8-8 1/2 vase. Measures 8 1/2" tall X 8" wide and 3 1/2" deep. The base edge has some very minor flakes also a small area of crazing with a little discoloration to the top of the foot. No other chips, cracks or repairs. 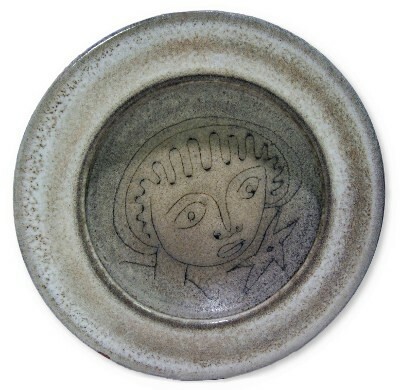 Arnold Jonker began experimenting in Pewabic Pottery type luster glazes just outside of Detroit Michigan circa 1945. It is believed he continued his work until the very early 1970's in other states as well. He created his own wares and called them "Aurora Borealis" after the magnificent natural effects. 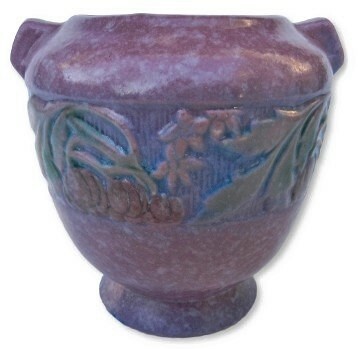 This vase measures 3 1/2" X 2 1/2" and retains its original paper label and felt pad between the label and the pottery vase. No chips, cracks or repairs. 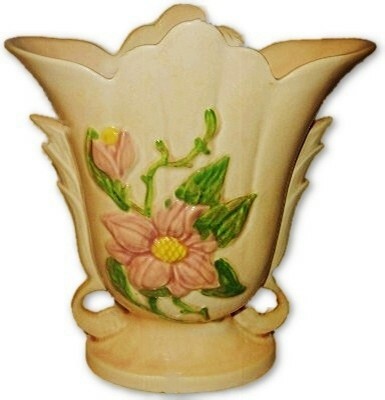 KENTON HILLS jewel porcelain lamp base by WILLIAM E. HENTSCHELL. The complete and original, bronze, and brass hardware on this item is marked CREST 1715. 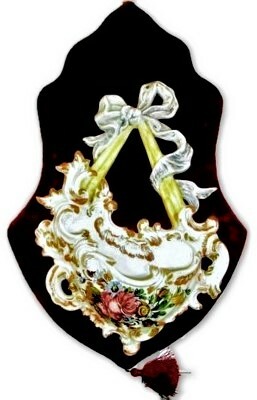 Crest Lamp CO of Chicago is considered one of the finest lamp manufacturers of the early to mid 20th Century. 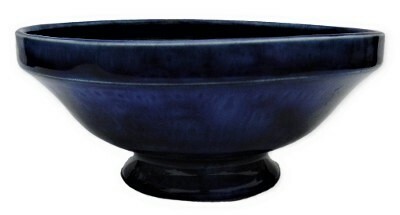 The base is signed on the side with William E. Hentschell's signature and the interior rim of the base is impressed 177 followed by black under glaze marks which I have not identified. 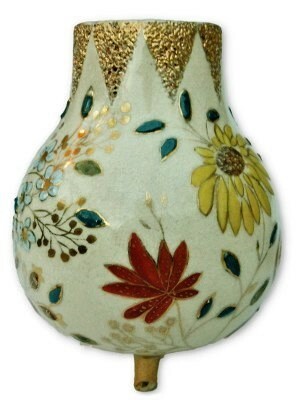 The Kenton Hills Hentschell Lamp Vase measures 13" tall and 6 1/2" across at the widest point. 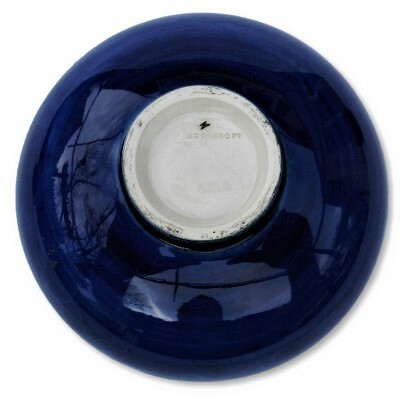 The overall height of this Kenton Hills/Crest Lamp base is 18 1/2" tall. Kenton Hills was in production only from late 1939 and ended all production by 1943. 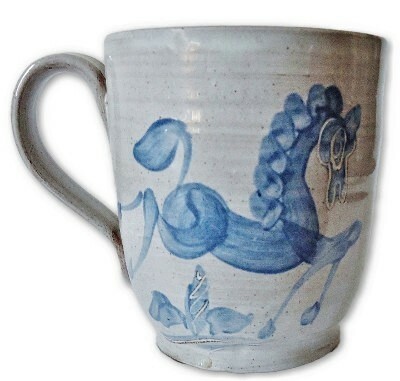 Kenton Hills was located in Kentucky and was a firm created by several Rookwood Art Pottery employees which included William E. Hentschell, David Seyler and Harold Bopp. This item has its original patina and even original dirt as we will not clean this item nor rewire it. No chips, cracks or repairs. Circa 1876 under glaze hand painted slip BARBOTINE style glazed pair of cavalier vases signed F. LANDRY A. PARIS. Measures 10 1/2" X 8 1/2" X 4". 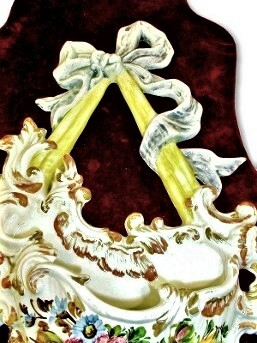 There are some minor early restorations to glaze flakes and scaling that is expertly performed on the feet and one near the top corner of one of the vases and one glaze flake on the edge of one foot. 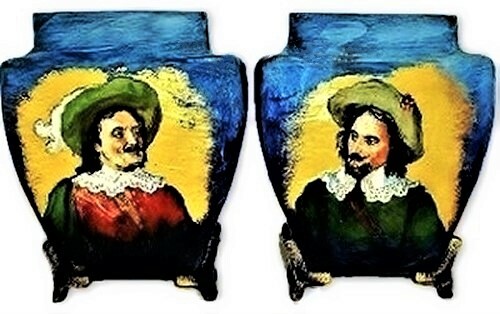 The base of one vase is impressed, F. LANDRY A. PARIS, while one vase is signed under glazed Landry & vase is initialed F.L. (the slip painted initial have a little tail making it almost appear to be an E. No other damage or repairs. 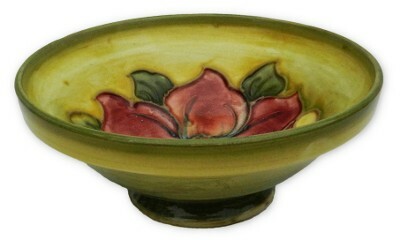 MOORCROFT POTTERY Clematis footed Compote bowl. 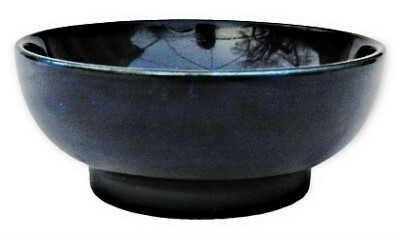 Measures 1 7/8" high and 4 1/2 " in diameter Signed on the bottom and light crazing. No chips, cracks or repairs. 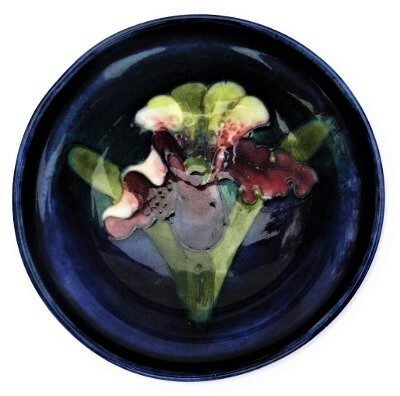 Moorcroft Pottery "Columbine" blue and green small footed bowl. 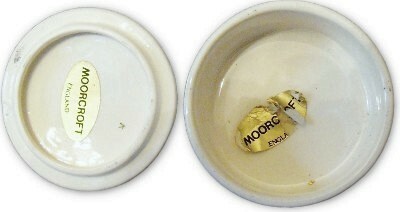 Measures 3 1/2" X 1 3/8". No chips, cracks or repairs. 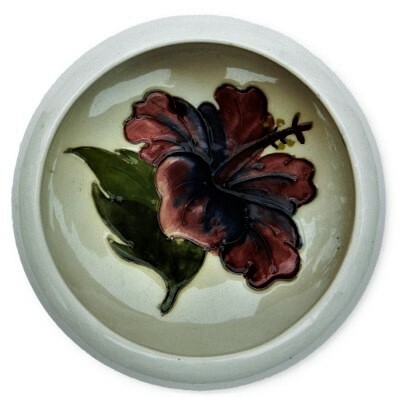 MOORCROFT POTTERY Hibiscus round covered box. 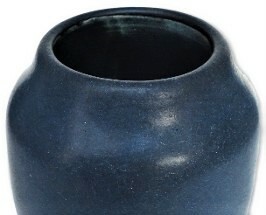 Measures 1 1/4" high and 2 1/2 " in diameter. Signed on the bottom Also has foil labels as pictured with light crazing. No chips, cracks or repairs. 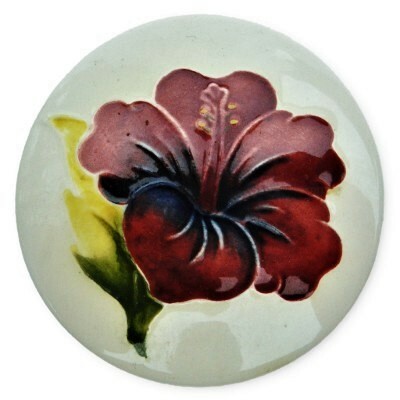 MOORCROFT POTTERY Hibiscus vase. Stands 6 1/4" high. Signed on the bottom with light crazing. No chips, cracks or repairs. 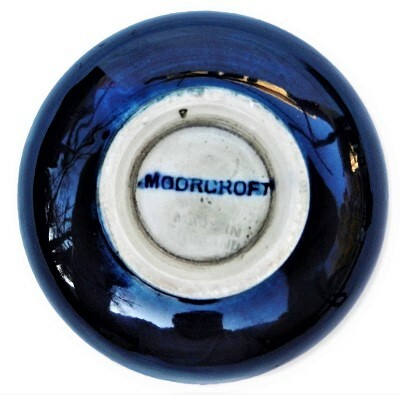 Moorcroft "Pomegranite" small blue footed bowl. 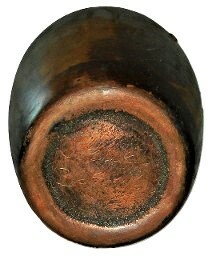 Measures3" X 1 1/4". No chips, cracks or repairs. 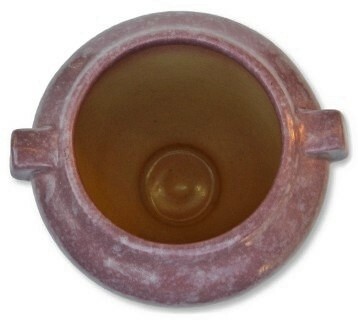 Roseville Pottery Baneda #587-4 pink vase. ROSEVILLE POTTERY 1915 CARNELIAN II gloppy matted glazed vase. Marked with the blue RV stamp. This is shape #313-9 and measures 9" X 5 1/2" X 4 1/2". 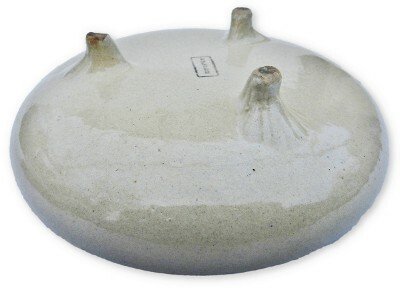 One of the cleanest examples with an excellent glaze treatment. There is a small in the making bottom edge clay divet, no chips, cracks or repairs. 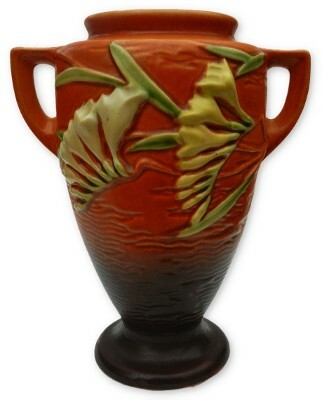 Roseville Pottery "Freesia" 121-8 brown vase. Measures 8 1/2" X 7" X 5 1/2". No chips, cracks or repairs. 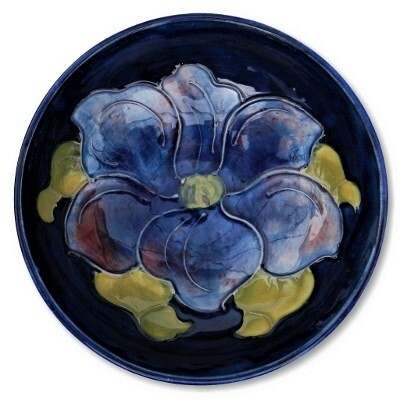 Roseville Pottery "White Rose" 980-6 blue vase. Measures 6 3/8" X 4 1/2". 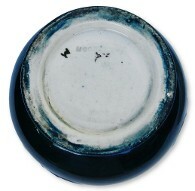 There is a small repair on the top edge as show in the image which is not colored or glazed. No other chips, cracks or repairs. 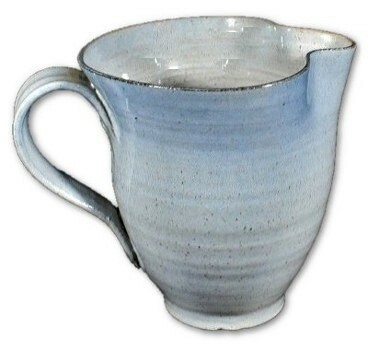 Mary Scheier hand-thrown pitcher with strap handle. Stands 4 inches tall x 4.5 inches wide.. A tiny in the making partially glazed over dip on the bottom rim of no harm. No chips, cracks or repairs. 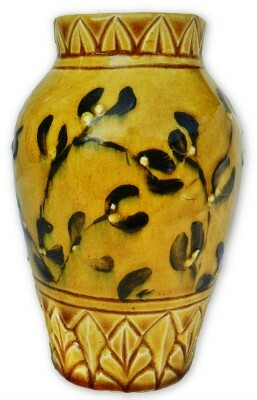 STANGL Pottery hand painted golden wheat covered box. 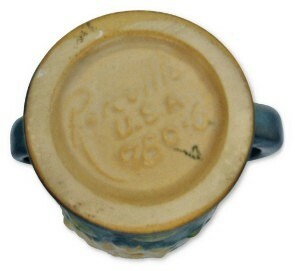 The base is marked under glaze Stangl Pottery Trenton NJ in an oval and hand painted artist initials JS. Measures 7 1/2" X 3" X 2". There are no chips, cracks or repairs. 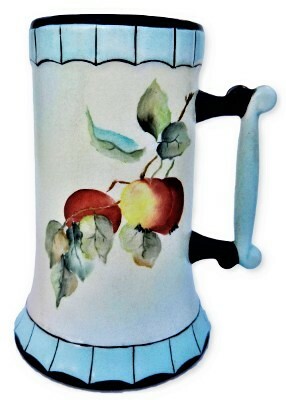 Sudlows Burslem "Royal" Made in England impressed mark art deco pitcher. 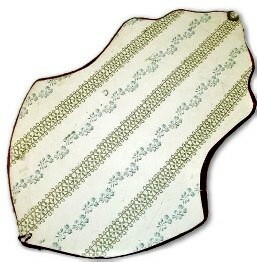 This ware is very similar to those produced and decorated by Clarice Cliff and Susie Cooper from the same area of England at the same time that this item was produced. 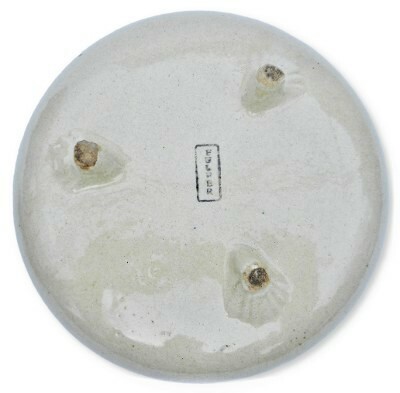 This item also is marked under glaze M 0 324 and a hand incised A. 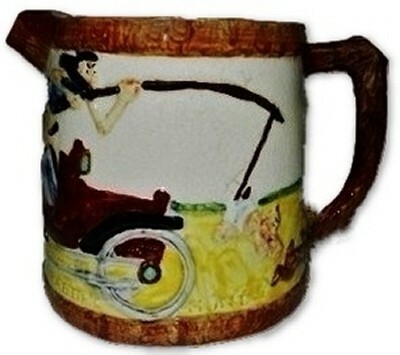 The ewer has a hand painted scene of a woman in a large, pink, dress, and yellow hat sitting and writing at a desk. 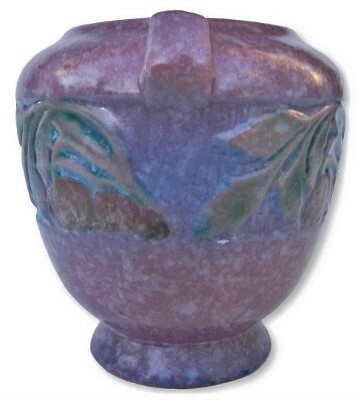 The landscape is in shades of purple, blue, an angular handle also has a lavender painted strip. Only light crazing. Stands 11 1/2" tall. No chips, cracks or repairs. 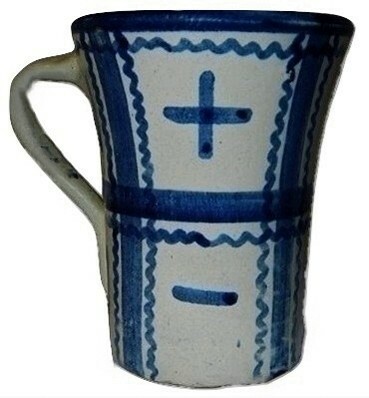 John B. Taylor Pottery, LOUISVILLE Stoneware predecessor PLAID pattern hand decorated stoneware tall coffee mug. 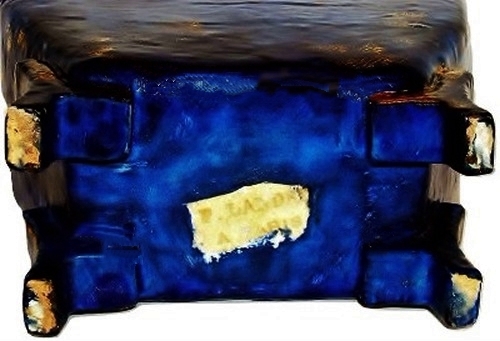 Under glaze hand painted design of alternating "+" and "-" signs separated by squares and rick rack. 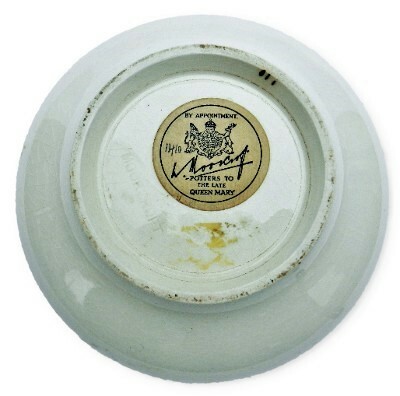 Artist initialed and a manufacturers logos are found on the underside. Measures 5" X 5" X 4". 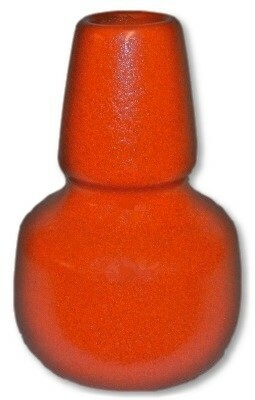 One glaze pop is located on the reverse side of no harm from the manufacturing process. No chips, cracks or repairs. 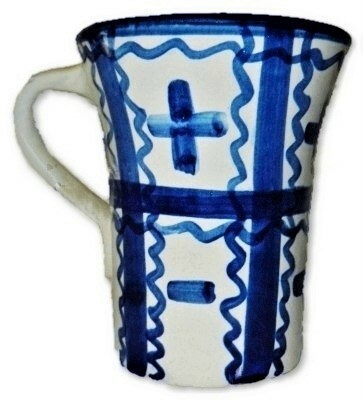 John B. Taylor Pottery, predecessor to the LOUISVILLE STONEWARE Company, hand decorated stoneware tall coffee mug. Under glaze hand painted design of alternating "+" and "-" signs separated by squares and rick rack. 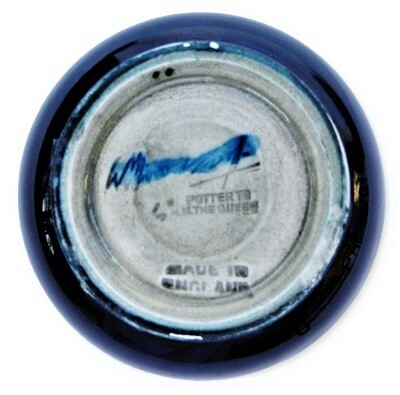 Artist initialed and a manufacturers logos are found on the underside. Measures 5" X 5" X 4". No chips, cracks or repairs. 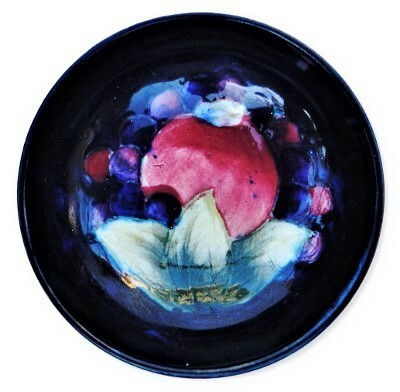 John B. Taylor Pottery, predecessor to the LOUISVILLE STONEWARE Company, hand decorated stoneware "GRAPE & POMEGRANATE" pattern sauce dish (3 available for purchase). 2 artist initialed RS and 1 artist initialed LF. 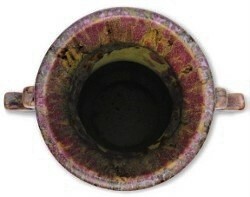 Measures 3 1/4" X 3/4". No chips, cracks or repairs. 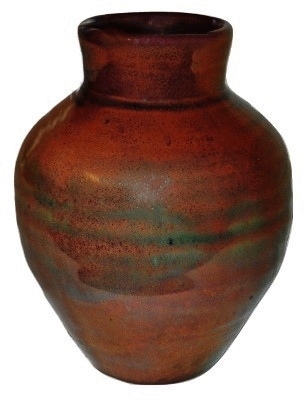 Van Briggle Pottery #645 Mountain Crag Brown vase. 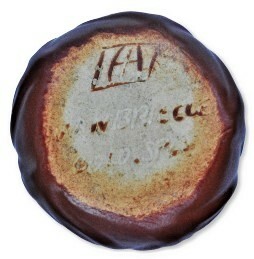 Marked with the circa 1930 capital letter mark. Measures 4 1/2" X 3 1/4". No chips, cracks or repairs. 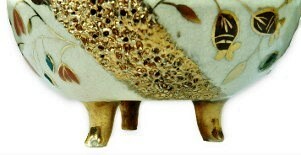 1940's VAN BRIGGLE Pottery luna moth vase in moonglo glaze. 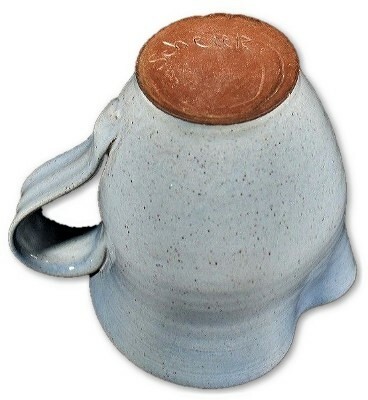 This item measures 3" high and stands 3 3/4" across at the widest point. 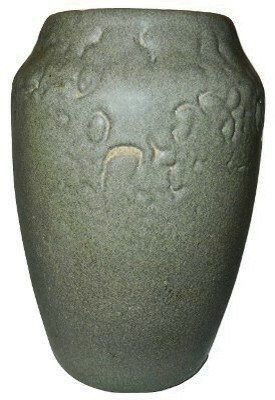 The vase has the shellac base markings of the AA mark and Van Briggle Colo. Spgs. Colo. No chips, cracks or repairs. 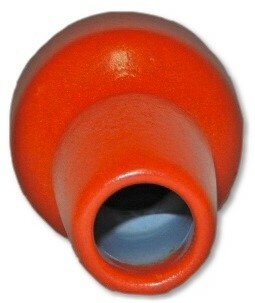 Weller Pottery "Chengtu" Orange/Red glaze vase. It has been suggested that this may be a Fru Russet form. 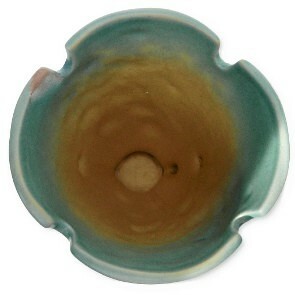 Measures 5 1/4" tall X 3 1/2" across at the widest point and the top measures 1 1/2" across. Unmarked, no chips, cracks or repairs. 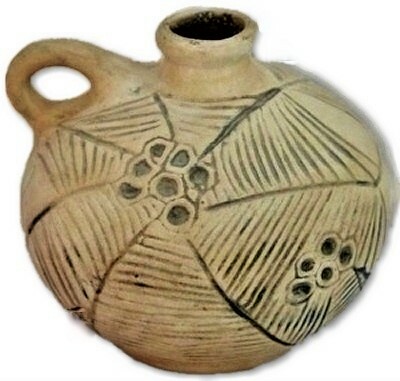 Arts & crafts WELLER POTTERY Claywood or Burtwood spider web handled jug. The incised spider web pattern is filled with black coloring to emphasize it from the buff ground color. The underside is in red clay. No company mark. Measures 5" X 5" X 5". No chips, cracks or repairs. 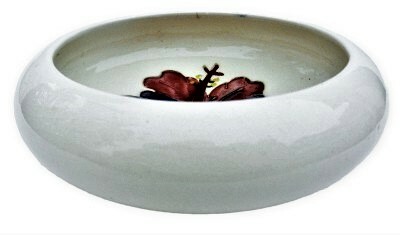 Weller Pottery "Clinton Ivory" small bowl. Relief strands of beads around the vessel. No mark. 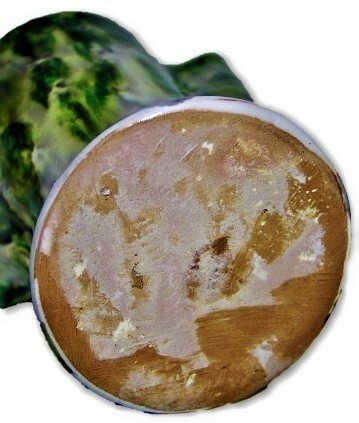 A few glaze bruises in the glaze at the rim. Measures 4" X 2". No other damage or repairs. 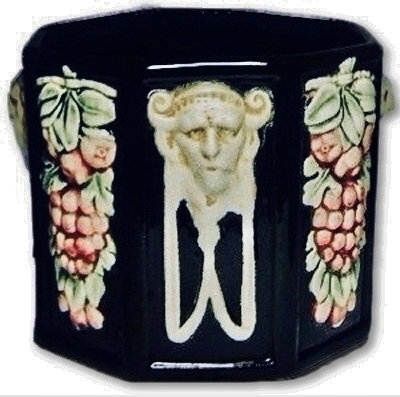 Striking marked in block letters "WELLER" octagon shape black Zona line jardiniere planter. This item measures 5 1/2" X 4 3/4". 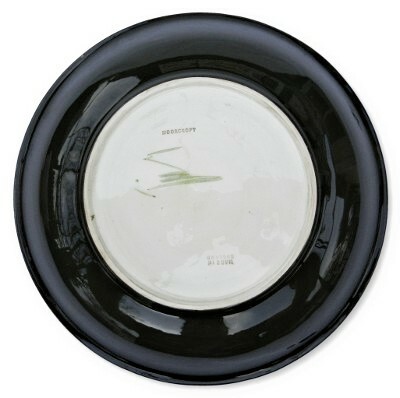 There are two very small scratch losses of black glaze on the very top rim, which show a tiny amount of the white pottery below. No chips, cracks or repairs. 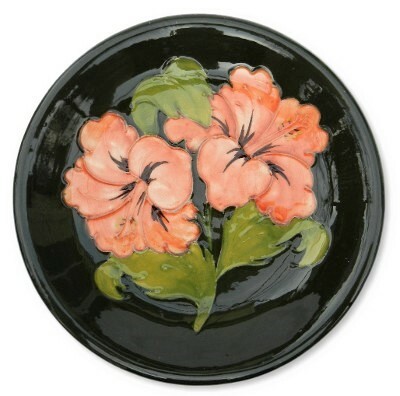 Arts and crafts WELLER POTTERY ZONA pattern plate (2 each available for purchase). 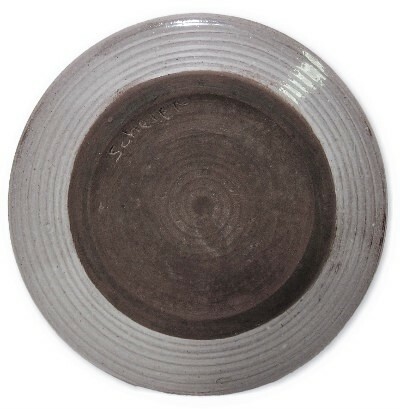 The plate measures 7 3/8" across and sits 5/8" high. 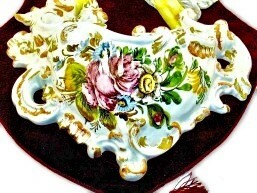 Brilliantly hand painted under glaze with expected very fine crazing and minor toning to the ivory background. The back is impressed in block letters WELLER which dates this item circa 1915. 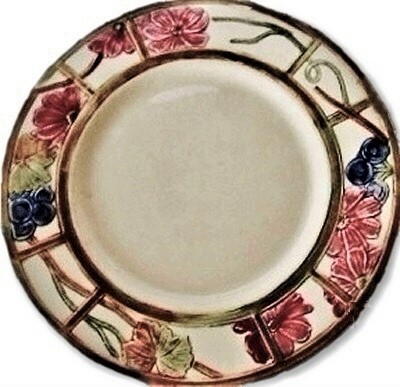 One of the available plates is numbered 2- and the other 7X. No chips, cracks or repairs.